Our city possesses a jazz saxophonist par excellence, who also has the knack of recruiting top maestri in their respective fields. 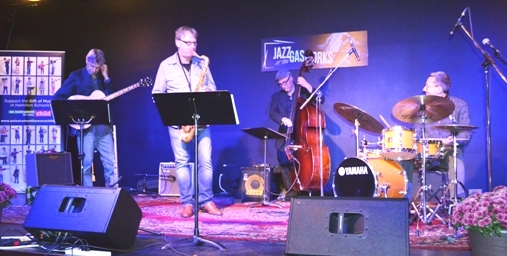 Last evening, there was a quartet concert featuring Darcy Hepner; was joined by bassist Roberto Occhipinti; Kim Ratcliffe on guitar and Andrea Marcelli on percussion. The evening was devoted to compositions or arrangements by the latter. The venue was the ‘Gas Works’ a creation representative of the generosity of the Voortman’s. Anyone who makes those maple leaf-shaped cookie that are to die for, has to possess a pure heart! The room is smallish but intimate with a cabaret-style set up. It’s perfect for a serious jazz concert aimed at a dedicated audience. We sat with the honchos of both the AGH and the HPO, & next to the Paikins & the Spiers. Not name-dropping; just illustrating the level of cultural sophistication the Hepners attract. Musically, the show belonged to Ratcliffe. No chord-player, him. He performs like Pepe Romero in a highly classical manner. One of his longer solo riffs had this O.F. wanting to take up the ‘six-string’ myself. Marcelli has a bio that is astounding, but his performing style is something less listenable than the HPO’s Portman. The man doesn’t seem to own a set of brushes and the sticks seem to magnetically gravitate to the cymbals and rims. Learning an instrument has numerous benefits. It teaches an appreciation of the classics; it instils a self-discipline through the practice procedure; it permits (sort of like non-pro golf) one to compete against oneself; and above all gets thumbs away from the video games and the IPod!!! The next concert is October 30th dedicated to blues and with an octet. The GasWorks is located at 141 Park St. North. F.Y.I. it’s a southbound-only street. The concept is valuable & worthy; the performance level supreme, and the result –indubitably positive. Let’s see you on Thursday, Oct. 30th.